Instant Pot Pork Tenderloin, ready in less than 30 min. 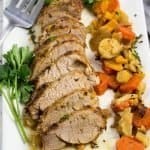 Use a marinated Smithfield Rotisserie Tenderloin root veggies to make an easy flavorful dinner. Turn Instant Pot on to saute. Let heat and add in olive oil. Add the pork tenderloin. Brown pork, about 2 minutes per side. Remove pork, set aside. Add in 1/2 can of the chicken stock. Use a wooden spoon to bring up brown bits. (Note 2) Add remainder of the chicken stock. Press Cancel to stop the saute function. Add in the sweet potatoes, carrots, parsnips, and white turnips. Season with pepper. Use the trivet to add the browned pork tenderloin on top of the veggies and stock. Seal the Instant Pot. Ensure the valve is closed. Press "Pressure Cooker" on high heat, set the timer to 5 minutes. Once the cycle is complete, allow a natural release for about 10 minutes. Remove the pork tenderloin. Let rest for about 5 minutes. Slice about 1/2 inch thick and serve with the veggies. Note 1: Non-stick cooking spray can also be used. Note 2: Bringing up any brown bits from the bottom of the Instant Pot is very important. This prevents burning.